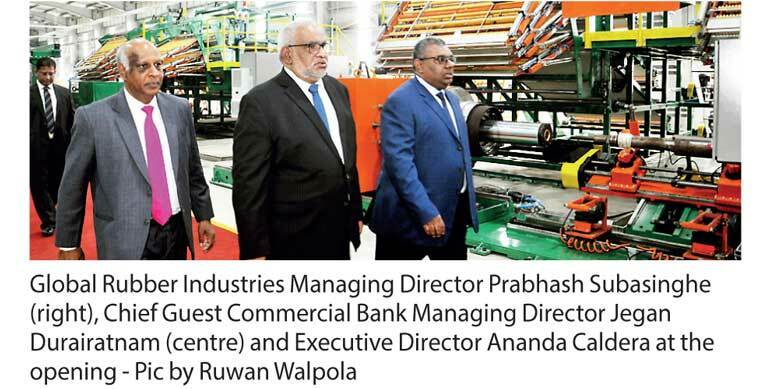 Global Rubber Industries yesterday opened a world-class advanced specialty tyre factory in Badalgama with a $ 40 million investment to manufacture radial agriculture tyres for the first time in Sri Lanka. The team at GRI has utilised some of the most advanced technologies available with globally recognised machines that allow for an increased degree of precision, lower operator dependency and much greater automation. These factors continue to drive GRI forward and will result in enhanced consistency, higher quality, greater efficiency and reduced cycle times. This factory is also completely self-sufficient, reaffirming GRI’s commitment to sustainability which is evident throughout in its 1.2 MW solar panels, biomass boilers and fully recyclable waste and water management systems. “This plant is a testament to the pioneering spirit and values embodied by all of us at GRI. Our values of purposeful action, relentless drive, far-sighted approach, coupled with a discovery mindset, are evident in every aspect of this plant,” Subasinghe said at the opening ceremony. The new facility will also add new items to the export basket of Sri Lanka and will comprise approximately 70% of Agrityre products and the remaining output will consist of pneumatic construction tyres, forklift tyres and OTR (Off-the-road) tyres. This plant will produce the full spectrum of tyres used in off road applications. The GRI Agriculture tyres are designed and developed utilising cutting-edge technology and have an excellent range of tread patterns, featuring high load carrying capacity at low inﬂation pressure, reduced soil compaction, exceptional traction, low vibration and superior self-cleaning properties. These high-ﬂex tyres operate exceptionally on roads as well as ﬁelds. The GRI Construction tyres are characterised by their unique tread designs, outstanding machine stability in demanding operations, together with its formula of special natural rubber compounds with heat, cut and abrasion resistance attributes. GRI’s advanced tread compounds enable longer running hours and superior performance. GRI began operations almost two decades ago with the establishment of the first plant for solid tyres. Since then GRI has gained entry to the world market, established new customers and has grown its business to over 50 countries, joining the elite league of global industrial tyre producers. GRI tyres are now used by Original Equipment Manufacturers (OEM) and replacement forklifts all over the world. GRI is also the largest producer of solid excavator tyres. It also produce tyres for port trailers, airport baggage handlers and skid steers. Subasinghe also said GRI would embark on an even more ambitious and exponential innovation program in the future. The company is now well into establishing an innovation lab that will harness the Internet of Things,the opportunity for machine learning or Artificial Intelligence, Augmented Reality and Virtual Reality to drive the business forward.